Born on November 25, 1981, twins Jenna and Barbara Bush have experienced a life unlike any other. Though they were raised in Texas, the Bush twins had a national spotlight thrust upon them at an early age thanks to the political career of their grandfather, Former President George H. W. Bush. In 2001, that spotlight became even brighter when their father, George W. Bush, became the 43rd President of the United States. Despite the rare circumstances surrounding their lives, both Jenna and Barbara Bush have managed to maintain a sense of normalcy, each giving off the vibe that they could easily be your BFF or cool, older sister. Though they’ve certainly experienced stress and scrutiny surrounding their father’s presidency and their own choices as college students trying to get away from it all, the Bush twins have adapted well to life as former first kids. And according to the twins themselves, they have each other to thank for that. Here’s the truth about Barbara and Jenna Bush’s relationship. If you weren’t lucky enough to be born a twin, you’ve probably held out hope for some time that you’d meet your long-lost twin at a sleepaway summer camp, in total Parent Trap style. Unfortunately, having a twin is simply not in the cards for the majority of folks. Luckily, we can live vicariously through Jenna and Barbara Bush, who never hold back their enthusiasm for one another. Jenna and Barbara Bush are fraternal twins, meaning they don’t share the same DNA like identical twins do. And however close they may be, it’s pretty obvious that the Bush sisters are two individuals who could not differ more from one another — both in looks and in personality. For starters, Jenna Bush (now Jenna Bush Hager), is the more well-known twin, thanks to her career in the public eye as a correspondent for Today. The bubbly blonde and loving mother of two doesn’t shy away from the camera, and can often be seen interviewing A-list celebrities and covering red carpet events for work. Barbara, on the other hand, is famously more reserved, rarely making televised appearances. Her friend, Derek Blasberg, told ELLE that Barbara is often unable to attend “glamorous parties” because she’s busy doing charity work in places like Botswana and Tanzania. The twins also differ in their political stances. Barbara is an outspoken advocate for gay marriage and women’s reproductive rights, while Jenna has skirted around those topics. But no matter their differences, these twins are still super close. Jenna and Barbara Bush had a unique adolescent experience. After all, not many kids can say their grandfather and father are both former presidents. The rarity of their experience is not lost on the Bush twins, though they’re quick to set the record straight if anyone thinks they were raised with a sense of entitlement. 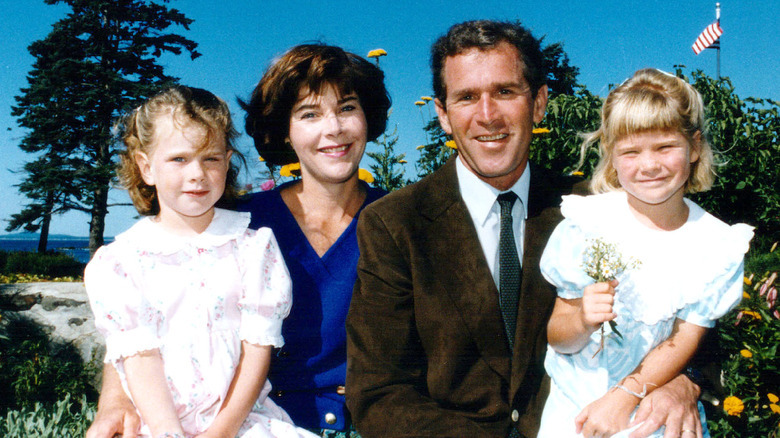 In the book, Sisters First: Stories from Our Wild and Wonderful Life – co-authored by the twins and released in 2017 — Jenna Bush recounts one of the girls’ first visits to the White House shortly after their grandfather, George H. W. Bush, had started his presidential term (via the New York Times). Comparing her sister and herself to Eloise at the Plaza, Jenna writes that the sisters’ first order of business was exploring the White House bowling alley and phoning the staff to request peanut butter and jelly sandwiches. However, instead of sandwiches, the twins got a stern talking-to from their grandmother, Barbara Bush. “[She] told us in no uncertain terms that we were not in a hotel, but temporary guests in a historic home, and we were never to do that again,” writes Jenna.